The Libra and Cancer relationship will give each other important things that they lack. They will both want a relationship that is full of security and reassurance. Both Libra and Gemini in love will enjoy their shared admiration of beauty and luxury. They will especially appreciate these things in a domestic life. They can easily mix their energies together in a balanced way if they decide to work together towards a common goal. The Libra Cancer compatibility might progress at a slower rate than some others. They will both need companionship and they both love beauty. However, at first they might be afraid they do not have anything else in common. They will get to know each other better the longer they are together. They will be able to recognize and respect the positive traits of each other better. Libra is ruled by the planet Venus. Cancer is ruled by the moon. Venus is concerned with love. The moon is concerned with emotion. The moon and Venus will share an adoring sense of home, family, and romance. Libra is symbolized by the balance and they are known for their balancing nature. Libra and Cancer soul mates both have nurturing personalities and prefer peace over arguments. More than any other pair of zodiac signs, they bring kindness and stability to those around them. They will have a lot of balance and domestic happiness together. However, Libra star sign has a life approach based on intelligence and can seem snobby and pretentious sometimes. Cancer zodiac has a life approach that is based on emotions. They will have easily hurt feelings to deal with. Libra is an Air sign. They see life as just a mental exploration. They prefer to focus on what challenges their mind. Cancer is a Water sign. They have an experience that is more tactile and physical. They will be happiest when their emotional needs are met. In the Libra Cancer friendship, they might find it difficult to understand each other at times. If the crab seems too irritated or the Libran seems too apprehensive, they might have disagreements. They will both need to learn to accept that each other have different ways of looking at the world. Libra and Cancer are both Cardinal signs. They might have issues over who is in control in the relationship. Cancer might get annoyed over Libra’s indecisive nature. Libra can use their subtle charisma and sense of fairness to follow the Cancerian’s decision. They can both easily start things, but if their approaches and ideas are different, then they might have disagreements. The best thing about Libra and Cancer compatibility in a romantic relationship is that they have a mutual admiration for security and balance in their home life. Aesthetics are important to them and they both love the comforting things in life. They have comparable tastes and loves. The Libra Cancer relationship will be very devoted and balanced. Libra dating Cancer will both look for stability and security. Because of this, they might seem to be very compatible by their star signs. They are very different people. They might end up in a balancing act that neither can win. The idealist and the homemaker will have different priorities. This will likely be the deciding factor. If they are truly in love, the love compatibility will not matter as much because they will be able to overcome their differences. If Libra or Cancer soul mates have any doubts, their relationship will be difficult. Libra and Cancer in love will share a romantic outlook. Libra is ruled by the planet of love, Venus, and Cancer is ruled by the body of emotions, the moon. Because of this, they will both love being in love. They both want a long term relationship. However, this is where the similarities tend to end. Neither Libra nor Cancer in a marriage will back away from combining their emotional and intellectual powers. They will both enjoy an occasional teary theatre show or a sentimental token. Expressions of love and sentiment are of high importance to both. They will be able to complement each other in different ways. The Cancer personality admires Libra’s charisma and discretion. Libra will be quiet and have cool, gracious skills. They will be able to calm even the worst pouting fit that the crab can come up with. Libra personality loves aesthetic beauty and balance. They will admire the Cancerian’s nurturing instinct. Cancer men and Cancer women can provide a cozy home and the protection that comes with it. They will be emotionally impetuous sometimes. They will need to be able to see different sides of situations. Libra will appreciate this. They can give a different perspective on different situations. If they do not see all the sides of a situation, they will have a habit of making decisions without knowing all the facts. Cancer will be able to help the Libra male or Libra female overcome their infamous indecisive nature. Libra is an air sign and works mainly on an intellectual level. They will see the Cancer’s mood swings and deeply emotional nature as hard to understand and somewhat alarming. Cancer is a sensitive water sign. They will be unsettled by how cold and emotionally distant the Libran can be. Libra and Cancer compatibility does not naturally have an emotional medium to build a long lasting relationship together. In a Libra and Cancer marriage, both will not be able to agree on very many things. They have different views on money, careers, friendships, goals, and politics. If they can have an opinion, they will likely have different ones. They will agree on the requirement for an affectionate and stable family life. If they love each other enough, domestic happiness might be able to keep them together. However, Libra and Cancer lovers might have a relationship that is short lived. They can both be somewhat passive aggressive and this does not help them. Libra and Cancer in bed are typically gentle and calm by nature. When they are together, they might have a sexual relationship that is bad tempered. They will seem to annoy each other. Their social life will cause arguments. Libra is sociable and wants to live the high life. They will bring some allure to the relationship. The Cancer born is a homebody. They just want to stay home and make their family happy. 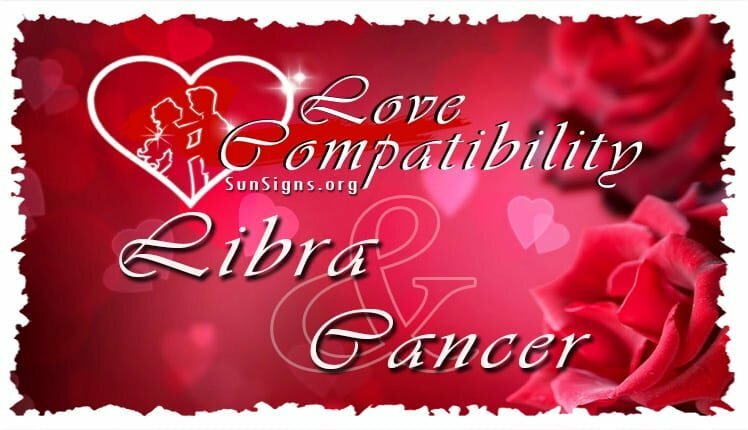 In a Libra and Cancer love compatibility, they will argue over who has control in the relationship. They both want to be in charge and they both want things done their way. Neither star sign will be very good at expressing their feelings. They are not likely to have any displays of tempers. There is the potential for them to hide their anger and this could ruin the relationship. Libra and Cancer break up can be avoided if they learn how to address problems when they come up. Otherwise, they will just deny there are any problems and they will get worse. Libra and Cancer couple will respect certain things about each other. Libra admires Cancer’s ability to make those around them feel loved. Cancer loves Libra’s wit and charisma. This might not be enough to give them the balance they need to have a successful relationship. This is a big issue. Balance is necessary for Libra compatibility. Cancer being compatible depends on having a peaceful and happy atmosphere. They might have too many disagreements for either one to be comfortable. Libra is an idealist. They will feel that the relationship does not live up to what they want. They will always want to improve things. They might want to improve the Cancer compatibility. The Cancerian will not be happy with this. They will likely be more stubborn and less likely to compromise. If they are in love, there is a chance they could have a successful Libra Cancer relationship.